Daschunds (sometimes known as sausage dogs or dackels) are one of the most instantly recognisable dog breeds in the world. They have been made famous by Disney, social media and well-known enthusiasts such as Peter Alexander. 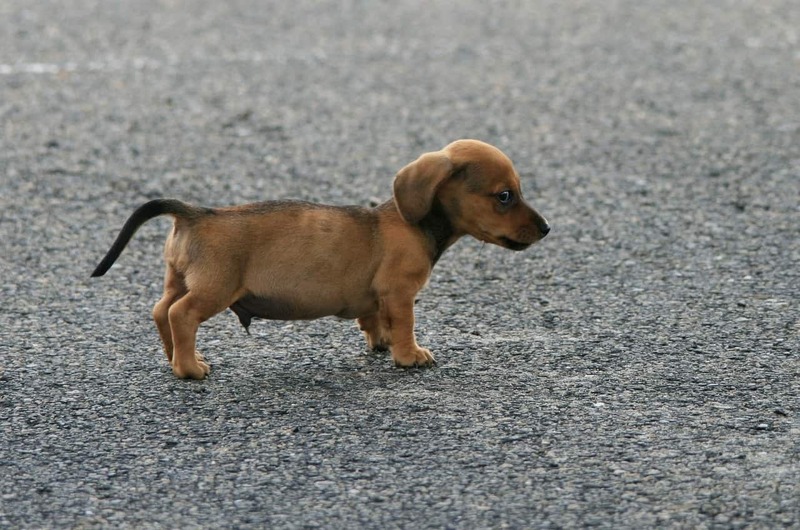 Daschunds are referred to as being chondrodystrophic due to their elongated back and short legs. Other chondrodystrophic breeds include corgis, basset hounds and some bulldogs. Having such a long back predisposes daschunds to IVDD. There are two types of IVDD. Hansen type one IVDD is the main type seen in Daschunds and involves the herniation of the spinal disc contents; this usually causes compression of the spinal cord, which in turn causes the clinical signs we see. These clinical signs include lameness, lack of deep pain, abnormal gait, urination and defecation issues, paralysis and pain, among others. Owners generally first notice there is an issue as their dog is in pain; for example, the dog may scream when touched along their back or when they bend down to eat from their bowl. Hansen type two IVDD involves a bulging of the disc contents rather than a full-on herniation. This type is less seen in Daschunds and is more of a slow onset disease seen over time. In order to reduce the risk of a Daschund injuring their spine, owners (and potential owners) should be aware of what factors contribute to these injuries. A daschund should not be overweight, as this puts more stress on their spine and their limb joints. Care should be taken when a daschund is playing, as excessive twisting and slipping (On wet grass or polished floors, for example) can lead to spinal disc herniation. IVDD is best diagnosed using a high slice count CT scan in order to get the greatest detail when imaging the small spaces around the spinal cord and vertebrae. It is a good idea to consider pet insurance for daschunds when they are puppies, as both spinal surgery and the conservative management of spinal injuries are quite expensive. As with many other small breed dogs, Daschunds are more predisposed to developing, or being born with, luxating patellas; this is the fancy term given to a dislocating kneecap. The patella sits at the front of the knee joint and aids in movement by providing leverage for the ligaments and tendons which move the joint. Normally, the patella sits within a nice groove within the femur and is buried within the quadriceps muscle. Luxation occurs when this little bone slides out of its groove; either medially (towards the inside of the leg) or laterally (towards the outside of the leg). Patella luxation is graded from 1-4 depending on both how easy it is to slip the patella out of its groove and how easy it is to pop it back in. The most commonly observed sign of a luxating patella is a sudden “hopping” one on the back leg. This occurs when the patella has luxated and it is uncomfortable for the dog to use the leg. Generally, the patella will pop back in by itself and the dog will continue to walk or run as normal. Over time, this luxating causes damage to the entire knee joint; the patella will be more likely to luxate over time and it is more likely that the cruciate ligament will tear due to the extra strain. Unfortunately, there is no way to prevent a luxating patella as it is something that daschunds and other breeds are born with. Daschunds are more likely to have luxating patellas due to their abnormally shaped limbs. If your veterinarian diagnoses a lluxating patella, they will recommend that it be surgically corrected in order to make your dog more comfortable and reduce the risk of a cruciate rupture and early onset arthritis. Just as with luxating patellas, daschunds and other chondrodystrophic breeds are at a higher risk of being born with hip dysplasia. This is due to the fact that their limb and joints are an abnormal size and shape. A normal hip joint is a “ball and socket” joint; the femur has a rounded end which serves as the “ball” and the pelvis has a deep groove of a similar shape to serve as the “socket”. Hip dysplasia is the term used to describe a hip joint that does not “fit” properly, resulting in instability. Clinical signs are seen early in life as the dog grows and include pain over the joint, reluctance to rise and exercise, muscle wastage of the hindlimbs and favouring the forelimbs. Hip dysplasia can be diagnosed with radiographs or a CT scan however the patient will need to be sedated for both modalities as they must lie very still and have their hips positioned in a certain way in order to view the joints properly. Daschunds are no more prone to developing obesity than any other breed, however, due to their physical appearance weight gain can be far more detrimental to their health. It is best to maintain a healthy weight in a daschund as any extra weight will increase the strain on both their long back and their short legs. As mentioned above, a daschund has abnormally shaped limbs and joints, which means that extra stress placed on them by weight gain will increase their risk of patella luxation, cruciate ligament rupture, spinal disease and arthritis. If you are concerned that your daschund is overweight, please consult your veterinarian for free weight loss advice.